How to Measure: How do I get the correct measurements I need to order my pergola kit? To find out the correct dimensions, please refer to the diagram below or call 800-230-0692 if you need help. 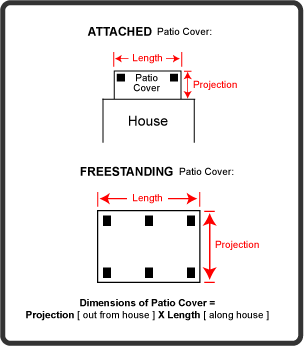 Note: Measurements for the length and projection are from the outside edge of the post. Note: When measuring projection and length, allow for additional 15″ beyond post for joist and beams. NOTE: The direction of the joist is the same as the projection.